More and more layering. I like to call it sculpting with pastel. You push the darks and pop the lights. 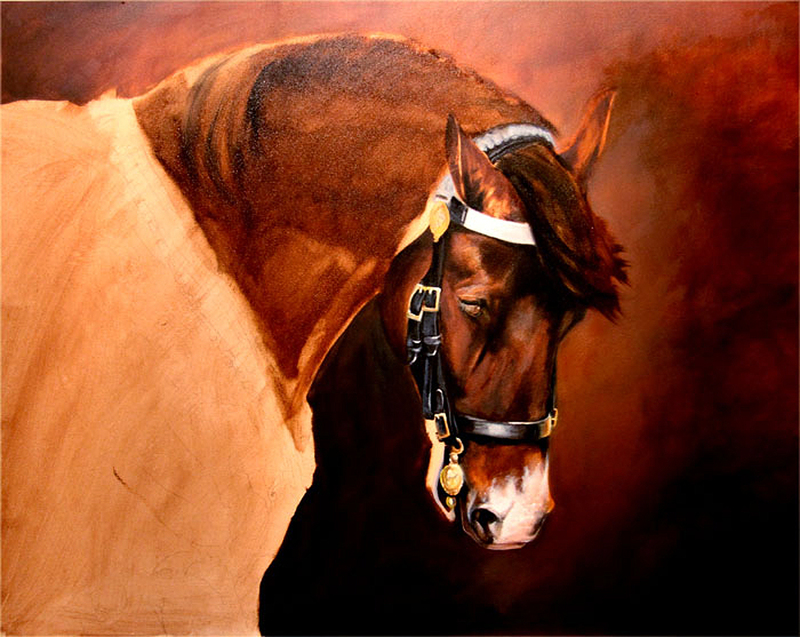 But be careful not to go to light with your highlights too fast, you will fight it for the rest of the painting. Those last little pops of lights will be your reward for a job well done. I am also always fine tuning my drawing. 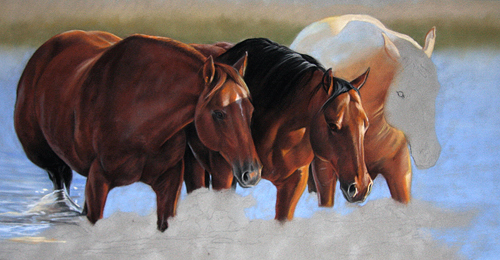 I moved the eye on the horse at the far right because I noticed it was too small and too high. And it is done. Do not forget that a white horse is never white. They are a mirror of everything around them, that is what makes them so much fun. 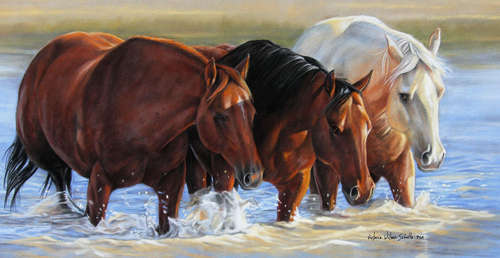 Notice how the tail on the left horse slims his hip down and pulls your eye back into the water and around again. 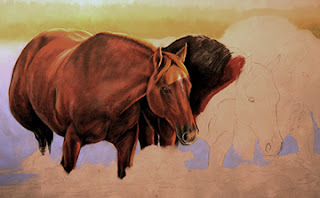 I was once told that I could not paint realistically or animals in pastel successfully. Well, I beat him in a pastel competition a few months later. Don't ever let a medium or some one intimidate you, there are no boundaries in art or in you. I am using an Ampersand Gesso board 16x20. I put a coat of turpentine and transparent brown oxide down before I drew the painting out. Now I am laying in the painting with Van Dyke Brown, Burnt Umber, and my own mixture of black. I use Sap Green, Ult Blue, and Trans Orange Oxide to make my black. 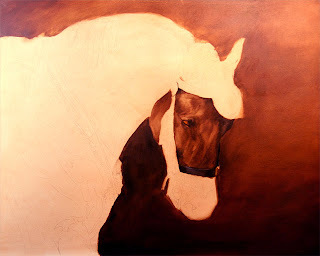 This horse is black as midnight, but I want the glow of the reds and oranges to come through the black on my final glaze. This is a personal choice, most people prefer a "cold" black for horses, but I am an earth tone junkie, so I always want my darks to be warm. 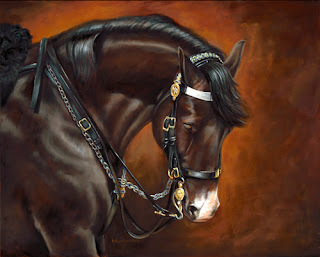 This is one of the horses that I photographed in London from the Horse Guard. 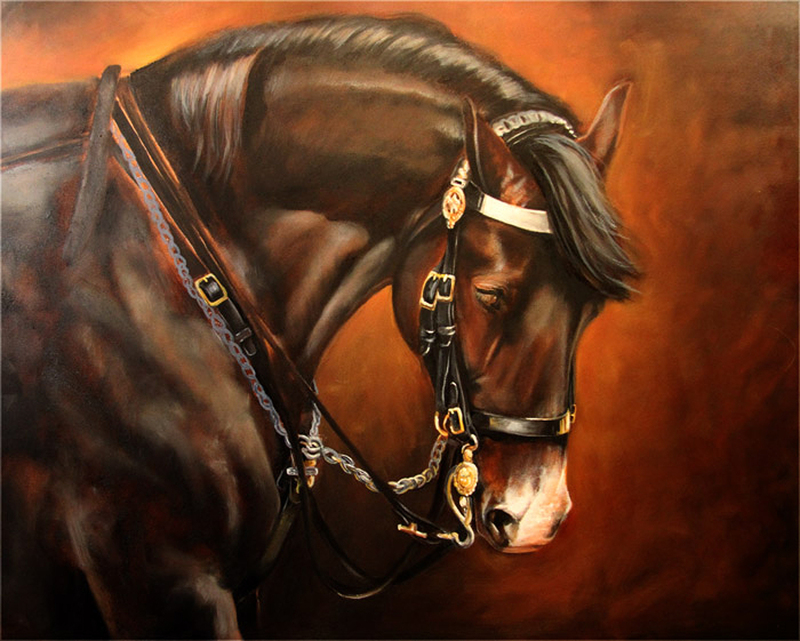 The bits, the bridles, and all the silver and gold are what drew me to do this painting. 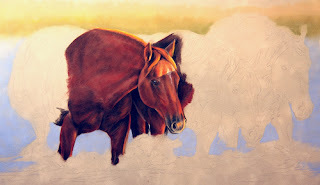 I have never done this kind of thing in oil, so it is going to be a great challenge. What better way to learn than to throw yourself into something you have never done before? 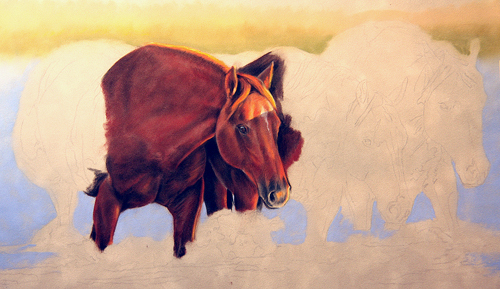 At this point, I glaze on some more trans brown ox, quinacradone burnt orange and start to block in the face. Notice I have covered up almost all of my drawing; this helps me be a little more spontaneous. I try not to get too picky at this point. I use large rounds and flats. I laid in the whites with blues and yellows. I don’t want to get to the highlights too quickly because you have nowhere to go from there. One thing that works for me with oils is to lay in the darkest value of color first and then hit the highlights at the end. So, for the bit and the chain, I put down a mixture of Payne's grey and Titanium White. I keep my layers thin and they dry quickly. With something as intricate as this, it is nice to be able to get to work first thing in the morning and not have to put it aside until it is dry. Here is the final. I moved all over the board and hit the details and highlights with #2 and #4 rounds. I prefer sable brushes over bristle, I feel that I get a smoother flow. I chose not to show too much of the eye because I wanted the viewer to see the softness in the horse’s movement and the gentle curve of his neck. As an artist, you can be an orchestra director for your audience. Lead them through the painting gently, let them find their own way and the rest will follow.